Provides a science program for students in grades 2–3 to educate them about their brains, why they should protect them, and how drugs such as nicotine and medications can be harmful. Includes six modules, parent newsletters, and videos. The National Institute on Drug Abuse's (NIDA) mission is to lead the nation in bringing the power of science to bear on drug abuse and addiction. The Brain Power! program is one effort in trying to reach this goal. Brain Power! is designed to take students step by step through an exploration of the processes of science and how to use these processes to learn about the brain, the nervous system, and the effects of drugs on the nervous system and the body. Through hands-on science investigations, a DVD, and supplementary activities that are linked to other areas of the curriculum, students with different learning styles and strengths are given numerous opportunities to grasp the material. In addition, an overall goal of the project has been to make learning fun and engaging and to instill in young students a lifelong interest in science. The program begins with the premise that a group of children has formed a Brain Power! club that receives problems, or missions, to solve from NIDA. Each module is built around a problem or scientific question. Students then use the steps of scientific inquiry to solve the problem. To guide the students through these challenges, they turn to Corty (short for “cerebral cortex”), an animated brain that helps the students ask appropriate questions and ultimately solve the problems. The following describes the six modules included in the Brain Power! program. Module 1: Ooey Gooey! Making Sense of Scientific Inquiry. The goal of the first module is to introduce students to the steps of scientific inquiry: observe, hypothesize, experiment, and conclude. Students use these steps to figure out the ingredients of the goo that is invading the Junior Scientists’ clubhouse. By observing and using their senses, students determine what substances to use to try to make another batch of goo. By the end of the session, students should be able to determine the ingredients of the goo. Module 2: Brains in a Box: What Your Brain Can Do. During the second module, students learn about the four major parts of the brain—cerebral cortex, cerebellum, brain stem, and limbic system—and their functions. They do this by making a simple model of the brain from Play-Doh or similar materials. In later modules, students will be asked to remember what the parts do when they start discussing the effects of drugs on the body and the brain. Module 3: Sending and Receiving Messages. This module builds on module 2 by introducing students to how nerve cells communicate with each other. This communication is known as “neurotransmission.” By simulating through a relay game how messages travel from the body to the brain and back through the body, students develop a basic understanding of the complex communication constantly occurring in our bodies. Students are introduced to some difficult concepts, such as the definition of a neuron, how neurons communicate, and what chemicals are involved in the process. Module 4: Medicine and Drugs: What's Helpful, What's Harmful. This module helps students classify drugs into two groups: helpful and harmful. The focus is on how different drugs can affect the body, including how harmful drugs can hurt us and how helpful drugs like medication can cure us. However, even helpful medications can be abused and can become harmful. The purpose of this module is to help students learn about drugs and think about how drugs can affect the body either positively or negatively. Module 5: The Science Behind Smoking. During this module, students perform a controlled experiment to see and compare what happens to a cigarette left in a cup of water for a week, a cup of water with nothing in it, and one with a leaf in it. By observing that the cup of water with a cigarette turns very yellow, while the other two do not, students can extrapolate the effect tobacco has on organs inside the body. The module concludes with a discussion of how nicotine causes changes in the brain that result in addiction to tobacco products. Module 6: How Drugs Affect the Brain. This module serves as a culminating activity and as an embedded assessment for the entire program. Students are given fact sheets about four substances—cocaine, marijuana, alcohol, and nicotine. Using the model of the brain, the neurotransmission model, and other materials available or created, students are asked to figure out what effects two of these substances have on the brain and the body. Students may present their ideas on a poster, as a skit, or as a comic strip. Teacher's Guide: This document includes a lesson plan for each module of the program. Each Teacher’s Guide includes an introduction to the module, learning objectives, how the module is related to the National Science Education Standards, scientific background that is helpful in teaching the module, a materials list, preparation that the teacher must do before teaching the module, step-by-step procedures on how to complete the investigation, discussion questions that help students synthesize what they learned, extensions describing how the activity can be linked to other areas of the curriculum, what teachers should look for in assessing students’ work during the activity, and resources for teachers and students. In some instances, the Teacher’s Guide also includes handouts such as forms, log sheets, and recording charts. DVD: Each module includes a DVD segment that sets the stage for the investigation by providing background information and summarizing the main ideas of the activity. The DVD segment for each module has two short parts: one to kick off the activity for the module and one to conclude the module. The DVD includes closed-captioning for hearing impaired students. Introductory Story: A teacher who does not have access to a DVD player can read the introductory story provided in text as a way to present the activity to the class. Trading Cards: Each module comes with a set of trading cards that provides additional information about the concepts covered in the module. Suggestions of ways to use the trading cards are included in the Extensions and Additional Activities sections of the Teacher’s Guide. There are two versions of the trading cards: a black and white version that can be reproduced easily and a color version with more detailed illustrations. Parent Newsletter: Each module comes with a newsletter for parents that comes both in English and Spanish. Each newsletter includes background information about what the children learned, questions or activities that parents can pursue with their children, an opportunity for children to express their thoughts about what they just learned, and additional resources. In some cases, such as in the Module 4 newsletter, it is strongly suggested that parents talk to their children about sensitive issues, such as the difference between taking Ritalin for ADHD and taking it recreationally. Parents should use their judgment about how deeply they wish to delve into these issues. Poster: Each module comes with a poster highlighting its main points. Teachers can hang the poster in the classroom to remind students of what they learned earlier and how it relates to the next module. The back of each poster contains one part of a puzzle. At the end of the six modules, when all the posters are hung together, the puzzle becomes a diploma for the students, stating that they have successfully completed Brain Power! The NIDA Junior Scientists Program. The program is flexible and adaptable to a variety of situations. Teachers should feel free to use any or all of its components in a way that makes sense for their students. For those who would like some suggestions on how to use the program, several ideas are listed below. Begin with a brainstorming session. Introduce the program by asking students what they know about the brain, the nervous system, and drugs. Do they see any connection among these topics? Are they puzzled that you are asking about them together? Then ask them if there is anything they would like to learn about these topics. Record their ideas on sheets of newsprint. You may find it useful to refer to them as you proceed through the module. Begin each module with the first segment of the DVD. The DVD for each module has been developed in two segments. The first segment introduces the activity. Show that segment to students first, before beginning the actual investigation. The DVD may pique interest for those students who are visual learners. The remaining segment is meant to be shown after students have completed the activity as a way to help them synthesize the information and conclude the lesson. Complete all six modules consecutively to build conceptual understanding. The program has been carefully structured so that modules build on one another. Topics follow logically and show a natural progression from providing a context for why we study drugs, to the brain, to neurotransmission, then to substances that affect the brain and the process of neurotransmission. The most effective way for students to understand the sequence is by completing the modules consecutively. Link the science program to other areas of the curriculum. Many ideas that integrate science with other areas of the curriculum are included in the Teacher’s Guide that accompanies each module. These activities help reinforce learning by showing students the connections between science and other areas of the curriculum, including reading, social studies, and language arts. It is helpful to do at least one extension for each module. Encourage students to use the Internet for research. The Additional Resources section of the Teacher’s Guide includes Web sites that children can visit to learn more about neuroscience and drugs. Encourage students to use this opportunity to become more familiar with using the Internet as a research tool. Be sure that students know how to distinguish reliable from unreliable sources on the Internet. Encourage them to look at the source of the information–its credibility and objectivity and any research that backs the information up. Be sure that they understand that anyone can put something up on the Web whether it is accurate or not, so they need to review the accuracy of all information that they obtain from the Web. Be aware of the sensitivity of students. 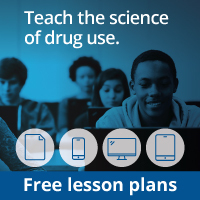 This curriculum is designed to cover drugs in greater detail. Encourage students to talk to you, the guidance counselor, or their parents if they have questions about the information presented. “Astronauts” trading card image courtesy of the National Aeronautics and Space Administration. “Oceanographers” trading card image courtesy of the National Oceanic & Atmospheric Administration. “NIDA Scientists” trading card image courtesy of the Centers for Disease Control and Prevention. “PET Scan” trading card image courtesy of the National Institute on Drug Abuse. “Phineas Gage” and “Camillo Golgi” trading card images courtesy of the National Library of Medicine. “Immunization” trading card image courtesy of Barbara Rice and the Centers for Disease Control and Prevention. “Tobacco” trading card image courtesy of Rick Ward through the Centers for Disease Control and Prevention.